I am looking for recomendations for a mounting system for a under the tube/barrel light mount on my 336Y. 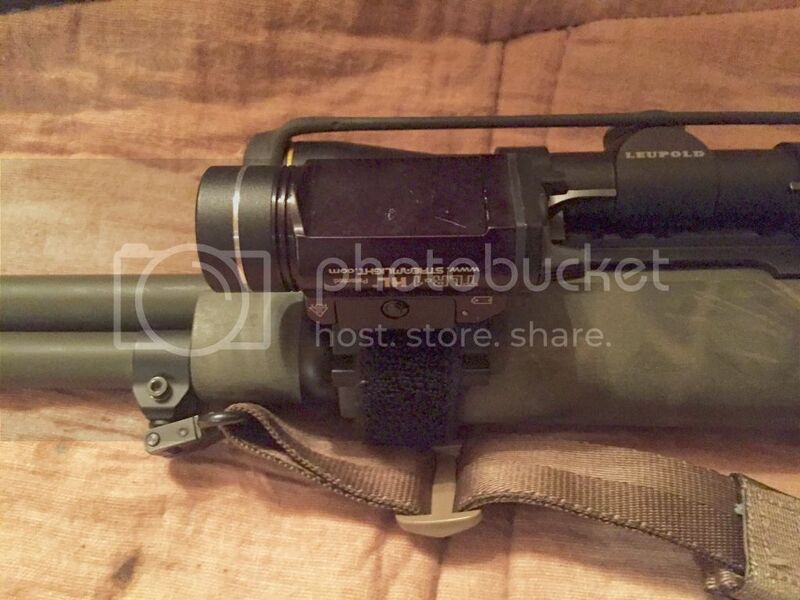 I am planning on mounting a surefire 1" to 1.25" diameter light. Any suggestions? Thank you all in advance. At this point you have only two choices. The first is to bolt a piece of picatinny to your front handguard. The second is the one from Wild West which you will have to modify to accept picatinny setup lights. When we asked Jim West if it would be available in pic he asked what is pic?, and that was about a year and a half ago. We recently finished up design on the LAAM, but pricing turned about to be about double what we were hoping for, and we are not sure they will sell at the price we would have to sell them for. We have shelved the LAAM design for now and are trying out an alternate design that should be smaller, simpler, and less expensive. Consider making it adaptable to either round or octagonal barrels...if that is possible. The new design will be, or I better say SHOULD be. We never go around to testing the LAAM on an octagonal barrel. 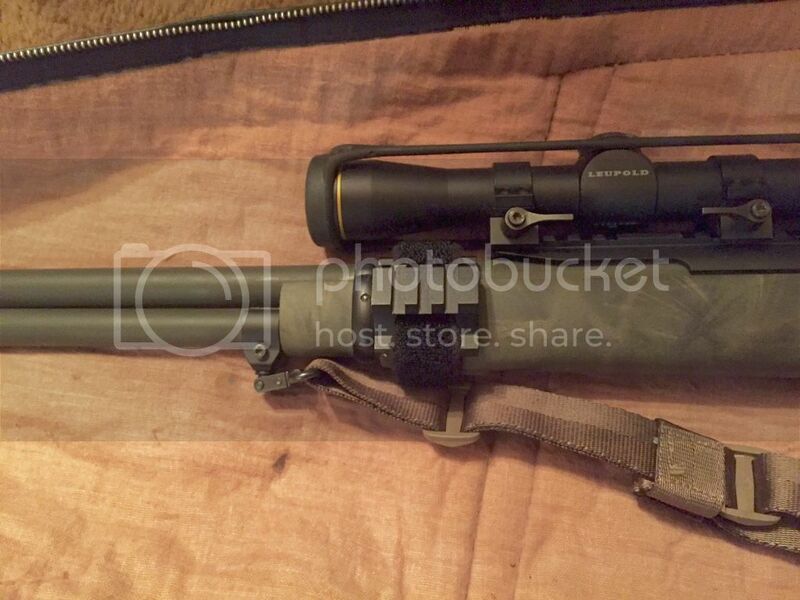 Checkout Grizzly Customs they have a mount for a rail on a lever gun, pricey but really nice. Easy to mount a light. I though Grizzly stopped selling those? Also unless things have change not a bottom light mount, but rather a side one. They are still on the website and I picked one up last year or so, maybe I am remembering wrong. I can call Lew and check. It is a side mount. I have successfully run a lever gun through a couple of rifle classes with a Surefire 6P taped to the rifle with some Battle Systems vinyl tape. As an interim fix until the Hill People Gear LAAM is finalized, I worked up my own. 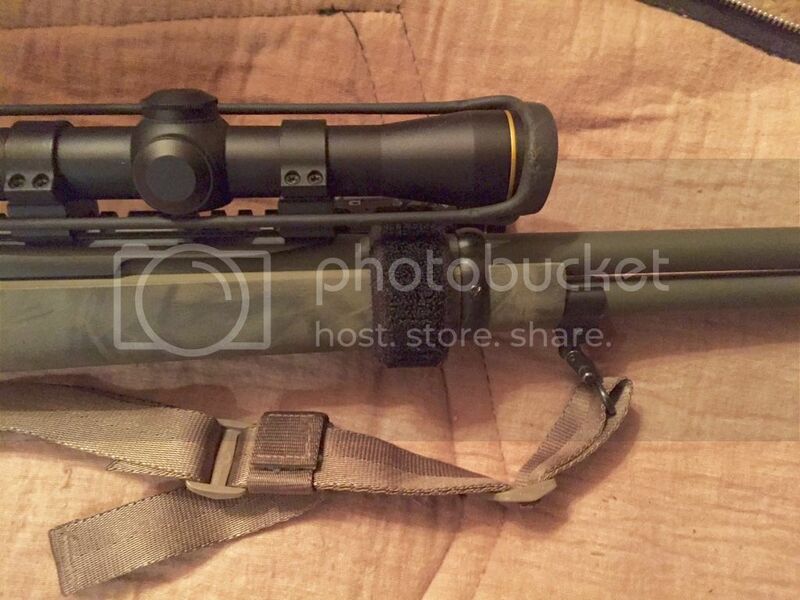 It's a side mount and I chose to mount it along the stock instead of on the barrel because it fits better without moving and also allows me to activate the light easier when it's shouldered. With my TLR-1 HL attached, it does throw a bit of shadow from off of the barrel...but not much...and allows more than enough light to get out to an intended target. This is a pretty simple method that does not require drilling holes in the stock or in the light mount. I bought a UTG Universal Picatinny Rail Adapter meant for shotguns http://www.cheaperthandirt.com/produc... and then took it apart. There are slots milled into the sides of the picatinny rail section. On the one I have, I didn't discover the slots until I took it apart. It turns out that the slots are sized just right for 1" Velcro straps. I then used a piece of 1" double-sided Velcro to route through the slots of the pic rail section and around my Marlin 336C. The inside edge of the pic rail section sits just on top of the forestock, along the barrel. This forms kind of a shelf for the pic rail section to "grab" onto and stay in place. It also cants the section slightly, but that actually works to my advantage. Once in place, my TLR-1 HL is held firmly, doesn't mar the surface of the stock or barrel, and allows me easy ability to manipulate the light switch. Until the Hill bros come up with something better, I'm pretty happy with this set up....especially for these reasons: it was inexpensive to fab, I didn't have to drill holes in my lever gun, and the position of the mount won't move or cause any shift of accuracy. Here are some photos...hope this helps other folks "MacGyver" something of their own! Look at you Ken rocking it ghetto style! Great work around! Reminds me of the days of maglites, epoxy and/or duct tape...oh yeah, and radiator hose clamps. Geez, El Mac...I was hoping it didn't look too ghetto! Yeah...just an interim solution. I may fab a better strap for it. I remember when I was stationed in southern Bavaria and we took on the CT mission there after another unit dissolved up in northern Germany...we got all the hand-me-down guns & kit. 5 cell Maglites hose clamped to the bottom of CAR-15s and MP5SDs....and...believe it or not....even some XM-177E2s!!! No forward assist on those bad boys! Talk about a barrel-heavy gun! Also ran the old PAC-2 lasers and welded extra long switches onto the safety selector switches so that they could be flipped quick and easy...a little scary, that! A dude shot himself in the foot at the Munich indoor range with one of those. We also used to cut down Remington 870s and bungie cord 'em to us as a back-up breaching tool / short yardage blaster...double ought buck or Shok-lok ceramic rounds. Add black Pro-tec bump helmets and body armor that probably wouldn't stop a .22.....and go for it!! Yep...them were the days! LOL! No...I like the work around...that is pure Americana. That "get it done" attitude is what America is all about. Or...dare I say, used to be about. At any rate, I look forward to the LAAM, but until then - you have come up with a great thing. I bet the slotted portion of it could be heated up with a heat gun and bent slightly in order to have it follow the curvature of the stock. Add a strong Velcro or maybe a short G-Hook strap....then done. This would be an even less expensive way to run a light on your lever gun. I don't think it would necessarily work as well out on the mag tube / barrel...but I reckon folks could fiddle around with it and see for themselves. Matter of fact, I went ahead and ordered a few of the ITW QASM-Ramp Picatinny Rail Adapters to try one of those out as a light mount...plus, mounting one of those to the Pals grid on the inside of a HRKB would be good, in order to have a perfect spot to hold my TLR-1 HL when not on the weapon. For a fighting rifle class, I used Battle Systems tape and taped a Surefire 6P to a lever gun. Worked just fine. Yeah....I just didn't want to just put tape on this rifle. Thanks all all for the input. After many many hours of searching, to the relief of my girlfriend, I figured it out. 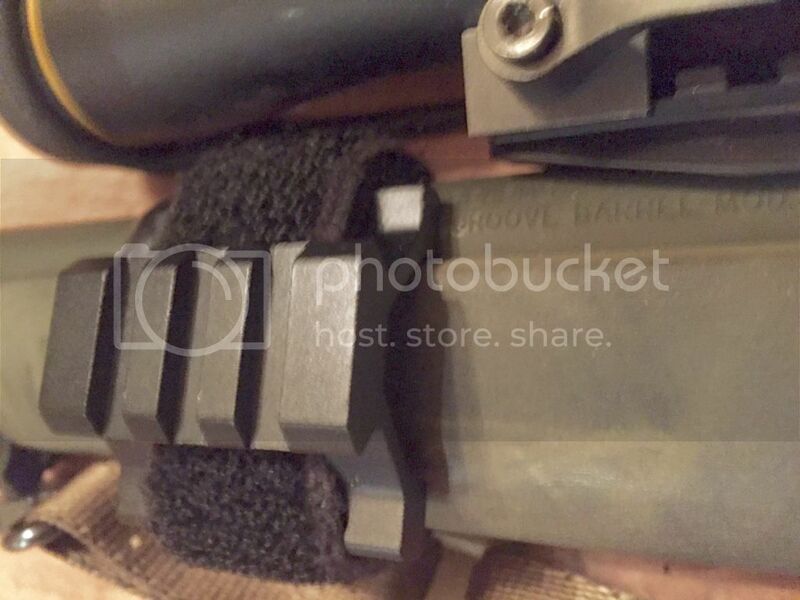 I thought the rail idea was interesting but I did not want the shadow of the barrel to show, it would be in the way of my support hand and last but not least, I wanted it more secured then with hook pile tape. A good temp fix, but not what I was looking for. So like I said after many hours of searching pics and forums, I went with the following. Beamshot #RF2 Laser Barrel Mount. After mounting the Surefire G2 using the supplied hex screws and tool, it is locked down and good to go. No shadow from the barrel, not in the way of my support hand, and can hit the pressure button with ease and turn the knob for continuous light. Here are some pics with the few things that I have done for the build. It has been slow going with work, getting ready to move out to "The Compund" and daily responsibilities. I will be reaching out for some more suggestions here soon for sights, and optic suggestions. But thank you all for the input, That is all... Doc out.. I am not sure what happened. The pics show up on my iPad. Will figure out and will add them. You have to use a program like Photobucket in order to upload them on the HPG Forum. There may be other programs that work, but Photobucket seems to work best.